The Kern HSE Laser System is the flagship model in Kern’s product lineup. A wrap around gantry traverses over the cutting bed allowing for finished parts to be easily removed from all sides of the laser machine. The moving gantry features high-speed servo motors and a flying optics beam delivery providing consistent beam power and quality over the entire work area plus the capability of etching at speeds of up to 150 inches per second, for images up to 52 inches by 100 inches in size. 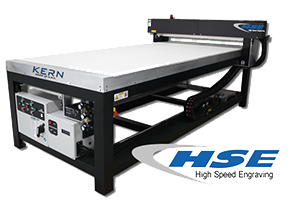 The Kern HSE Laser Machine is versatile to the degree that it will quickly process acrylic, metal, wood, stone, foam and more. The Kern HSE Laser Machine truly is the laser system of choice for sign makers, metal fabricators and educational institutes around the world. Available in 30, 50, 100, 150, 200, 250 and 400 watt configurations. Bed Sizes from 52”x25” (1320x635mm) to 80”x120” (2032x3048mm). All lasers sold by Kern are designed and manufactured with pride in the USA. The HSE motion package is powered by servo motors on both axes allowing for engraving at speeds up to 150″/sec with 5G’s of acceleration. Smoke, fumes, and small debris are all removed by a vacuum system that pulls from both below and above your material. A downdraft vacuum will hold your material down to the table while it is being cut and engraved. A high-performance computer and monitor are provided with each laser system. Kern’s state-of-the-art KCAM laser cutting and engraving software is included on every laser system. An easy to use printer driver will send your vector and raster files to the laser. Upgrades to the KCAM software are always free of charge and readily available on our website. Your choice of design software such as CorelDRAW®, AutoCAD LT® or Adobe lllustrator® is also included. A UL certified electrical panel is placed on each laser system which turns on and shuts down components of the laser system. HSE laser systems are CE compliant to meet European Union consumer safety, health and environmental requirements. U.S. CDRH compliance requirements are upheld on the HSE laser system to meet specifications in 21 CFR, Subchapter J, parts 1040.10 & 1040.11. A closed loop chilling unit is included on all laser systems of 100 watts or greater. This chilling unit will keep your laser head cooled and running smoothly. A top-of-the-line motion package includes parts selected from US companies that value the idea of high tolerances, great repeatability, and precision accuracy. The flagship model in Kern’s product lineup. A wrap around gantry traverses over the cutting bed allowing for finished parts to be easily removed from all sides of the laser machine. The moving gantry features high-speed servo motors and a flying optics beam delivery providing consistent beam power and quality over the entire work area plus the capability of etching at speeds of up to 150 inches per second, for images up to 52 inches by 100 inches in size. A Class 1 (safety enclosure) machine design, ensuring personnel working on or around the system are kept safe while the system is in operation. The Class 1 safety enclosure is the ideal system to be placed in high traffic areas such as busy factory floors and university classrooms. Access points are available at the front, back and each side of the machine making part loading and maintenance simple and convenient. Kern Lasers’ entry level MICRO Laser System features a small format laser work area. However, it can be equipped with the same powerful lasers as our large format models. The MICRO Laser Machine comes standard with high-speed engraving technology and a moving Y axis bed for fast, accurate vector cutting. The OptiDual Laser System was specially designed for customers that require a laser system capable of high production cutting. The OptiDual features two lasers mounted on a single gantry. The second laser is connected to the master laser by an adjustable bar. As the master laser is cutting a part, the second laser will be cutting the same part just inches away. Both lasers output power can be matched within the KCAM software. This ensures that the parts being produced are similar in size, accuracy and quality. 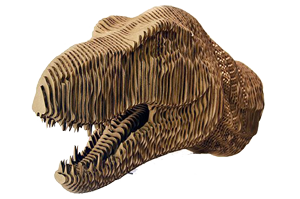 Z12 Lasers offers the greatest amount of detail available in the monument etching industry. The strong, solid steel frame and extra high gantry are designed to handle heavy stones up to 12″ thick. A wrap around gantry and roller bed table makes loading and unloading of material quick and easy. The low profile table and pass through design allow for easier integration of existing conveyor systems. Urns and caskets can also be laser engraved with beautiful results. Kern Laser Systems can be equipped with our innovative pulsed laser technology which allows for accurate cutting of sheet metal. Commonly cut metals include stainless steel, mild steel and aluminum. The OptiFlex is Kern’s flagship high performance laser system. The HyperDual motion package installed on the OptiFlex is setting the standard for large format laser cutting and engraving machines. This improved motion system features a rack and pinion design and powerful servo motors at each side of the laser table. The FiberCELL is a compact sheet metal fabricating fiber laser system, capable of cutting a variety of metals such as stainless steel, mild steel, aluminum, brass and copper. A Class 1 safety enclosure allows the system to be placed in high traffic areas such as busy factory floors and university classrooms. Special polycarbonate windows are installed to ensure harmful laser wavelengths are filtered and cannot leave the enclosure.